The Immigrant Yarn Project brings together Americans from all over. Published on Monday, September 10, 2018. This article appears in the August/September 2018 issue of American Craft Magazine. Contributions, such as this Swiss/US flag, have been pouring in. As Cindy Weil jogged near the Golden Gate Bridge last summer, her eye was drawn to Angel Island, a processing center for immigrants in the first half of the 20th century. The hot topic of immigration had been on her mind, and it felt personal. Like most Americans, she comes from immigrant stock: Her mother was from Ireland, her father’s family from Germany. Amid all the current division and rancor, she wondered: Wouldn’t it be nice if we could unite in celebration of our shared immigrant history? She envisioned a public art experience for that very purpose, on that very spot: a big, beautiful, by-the-people statement, expressed through knitting, one of her favorite pastimes. 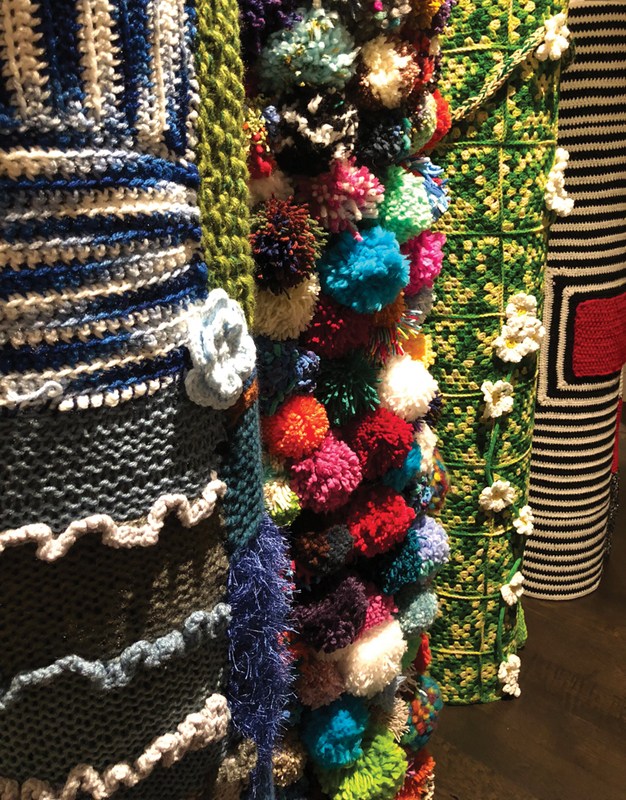 Through events and exhibitions, the group aspires to “foster positive discourse around difficult topics.” Though its subject may be politically fraught, the yarn project aims to be inclusive, welcoming all to help create a patchwork that reflects the diverse fabric of the US. 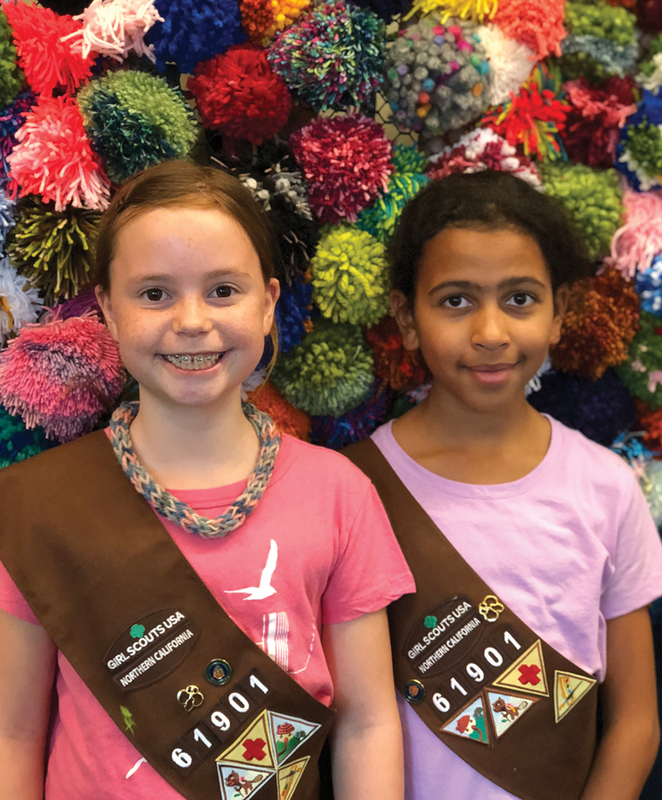 A California Girl Scout troop contributed pom-poms. SF Men Knit, a group of Bay Area crafters, is covering its own column. 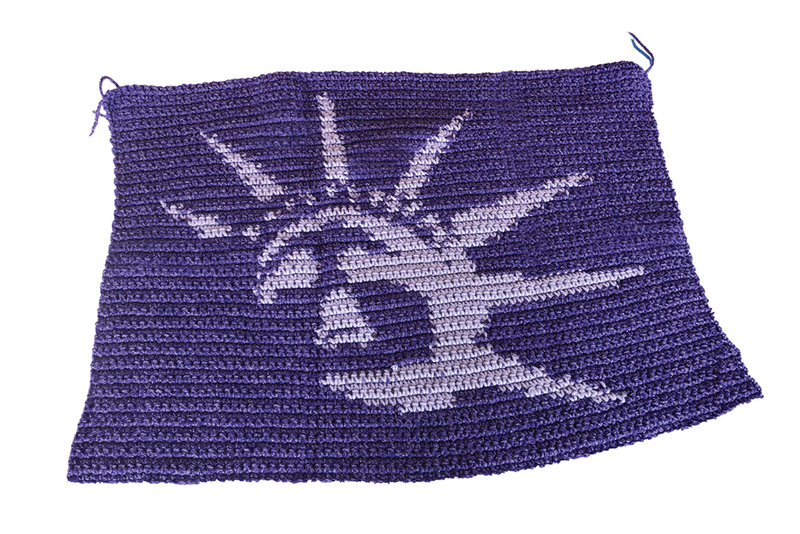 Contributions range from simple squares knit by beginners to intricate creations, such as an abstracted Statue of Liberty; Weil is delighted by them all. 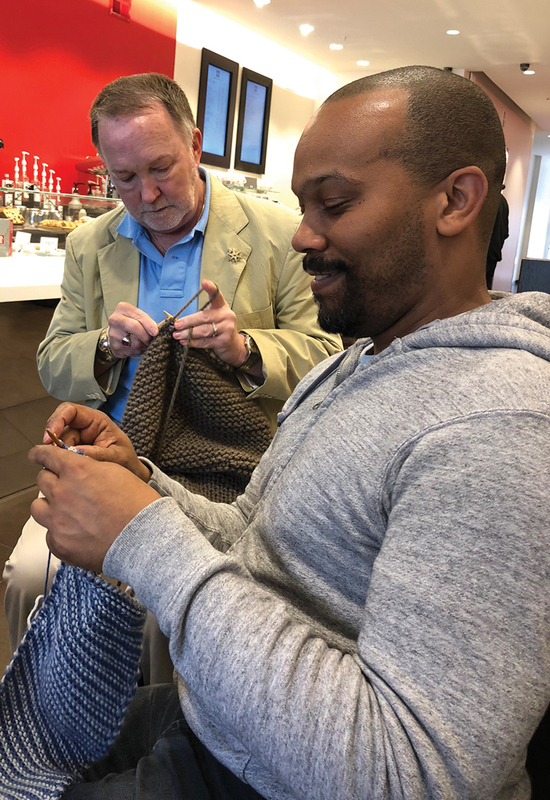 SF Men Knit, a group of Bay Area crafters (“So next-level, just insane knitters,” she gushes) is covering its own column. Former Secretary of State Madeleine Albright and award-winning author Jhumpa Lahiri are making pieces. The project has also brought in knitters from what Weil calls “invisible populations” – the elderly, Japanese Americans held in internment camps during World War II, immigrants living outside the mainstream. One woman sent fragments that her late mother, a war bride from England, knitted while suffering from Alzheimer’s. Weil works with volunteers to arrange and sew the pieces over the columns. To encourage beginners to participate, the project’s website includes video instructions for making pompoms. “I love the hands-on maker aspect of the project,” Weil says. 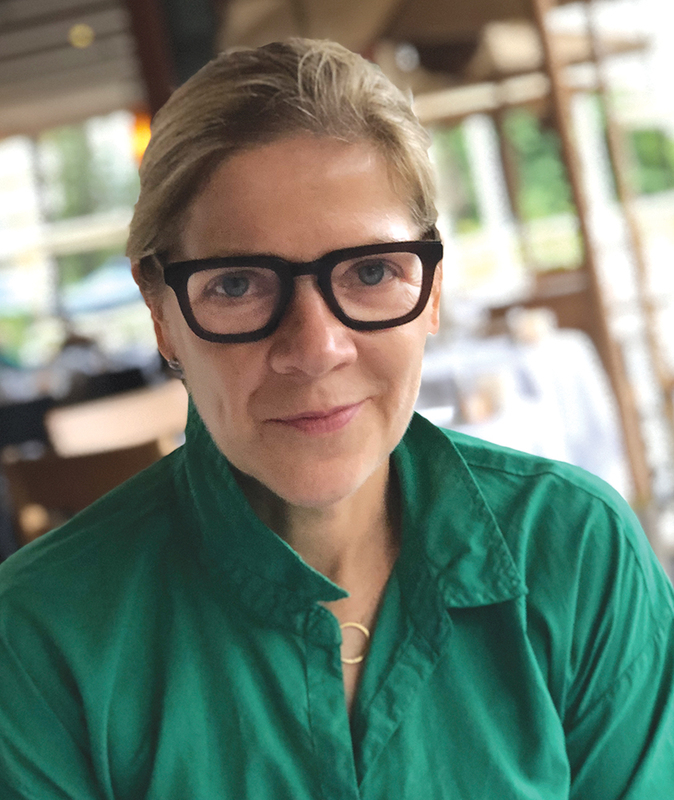 “But it also calls on my organizational, business, and communication skills.” She began her career in the 1990s as a director at Ameritrade, later becoming an executive producer for Martha Stewart Living Omnimedia; in the 2000s, she had her own artisanal wallpaper company. By 2017, she was ready for a new challenge; wanting to make a difference, she turned to social activism. She had worked on the Hillary Clinton campaign and seen the far-reaching impact of a pink knitted hat at the Women’s March in Washington, DC. The controversial travel ban and DACA pointed her toward supporting immigrants. The Immigrant Yarn Project is accepting submissions through the life cycle of the project.